An afternoon riding in a random Pacific Northwest national forest and your gas tank isn’t the only thing running on fumes. Sun parched, exhausted from hours standing on the foot pegs and confused as to where the hell you are, because you travel sans GPS (in the true adventure spirit), your stomach is begging for calories. Sipping water and dreaming of that meatball sub you were planning to nosh on some three hours ago and you're about to pack it in. Kickstand down, the only sound other than the rapidly cooling steel of your engine is a hidden army of relentlessly chirping crickets. You start to seriously consider roasting up a few of those noisy MF’ers on your carbureted motor's cooling fins, before quickly reeling yourself back in. Even if you were able to catch a few, you would still need a bottle of cooking spray to keep them from sticking. Alas, you finally find your salvation in an expired gas station sleeve of peanuts that proudly congratulates Jimmy Carter on successfully running for president….you've been riding a long time. 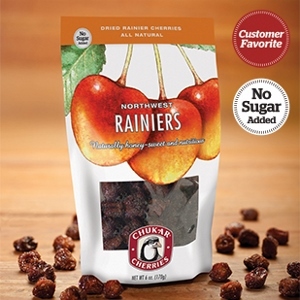 Putting the standard dried fruit to shame, Chukar Cherries “Rainiers” are the absolute tops when it comes to the dried fruit category. A perfect combination of sweet and tart, these go anywhere nuggets of deliciousness are great on their own, mixed in oatmeal, trail mix and even pancakes. Just one handful trailside or roadside and you’ll be back to life, ready to ride for hours. 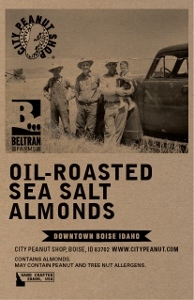 The foundation for all travel food, a good salted almond is just as important for satiation as it is for nutrition. Packed with protein and essential elements, you’ll be craving these as soon as hunger kicks in. A long ways from your standard “tree bark” roasted almonds, the folks at City Peanut Shop really hit the roasting sweet spot. Not too much salt and just enough time under the heat to bring out the natural flavors. Some of the best you’ll ever have. They’re packed with magnesium, an essential nutrient to lowering blood pressure. Easily, some of the best chocolate on the planet, if you can find a shaded storage spot on the bike to keep it from melting, this is an absolute must. 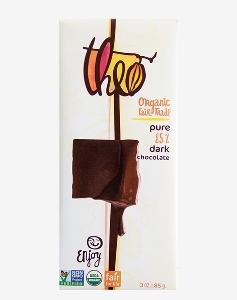 Often thought of as a daytime snack, Theo’s 85% makes for an incredible “jump start” breakfast on cold mornings. Loaded with healthy fat, requiring no preparation and featuring the perfect balance of sweetness, pair it with a camp side cup of boiling hot coffee or tea and you won’t need anything else. Well, ok, maybe a few of those almonds would help hold you a little longer before lunch. For many, meat withdrawal is a real thing and going a meal or two without can have disastrous mental consequences. Sure, your body may not “need” it, but your soul relies on it for inspiration. 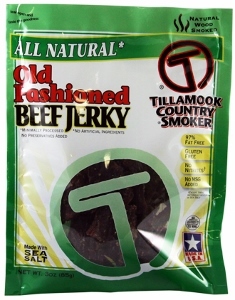 Harkening back to the original Northwest pioneers, Tillamook Country Smoker keeps it simple with minimal ingredients and lets the smoke/meat do the talking. Tender, in a way that few jerkies are, the salty/sweet combination will help beat back hunger pangs, keeping keep your mind focused for the next ride segment. What is “grain free granola”? For starters, it isn’t really granola and that’s a good thing. 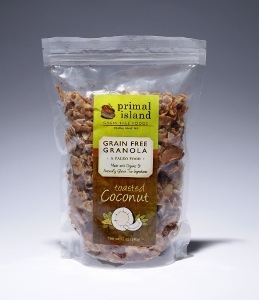 Traditional granola packs well, but doesn’t really offer much in the way of nutrition. And on hot days, you often end up feeling like you're eating sugary sawdust. Not so out on Whidbey Island. Made primarily with toasted coconuts, almonds, pecans, honey and cinnamon, this one-of-a-kind snack mix packs a mellow sweet, nutritional punch and will ride in your saddle bag for weeks. As you prep for the next riding season, make a note in your spring calendar to stock up on a few of what we would consider essential snacks. They’re good and good for you.